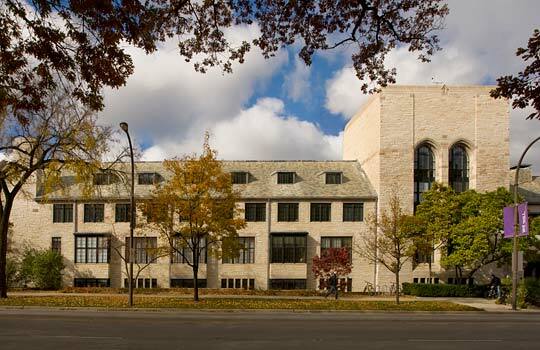 Completed in 1940, the Scott Hall and Cahn Auditorium complex, an Evanston landmark, was designed by architect James Gamble Rogers. As the architect for masonry and steel window restoration, MIA conducted masonry inspections and surveyed windows to design appropriate repairs. Steel window restoration included adjustments to misaligned steel, splicing in new steel sections as required, reglazing, stripping, and painting. Interior secondary glazing and screens were also installed. Masonry restoration included cleaning, selective repointing, limited stone replacement, and replacement of steel lintels throughout. The restoration project received a 2015 City of Evanston Preservation & Design Award for Proper/Rehabilitation/Restoration and a 2015 Design Evanston Citation of Merit for Rehabilitation/Renovation.